How to Export Data from InterBase or Firebird? InterBase/Firebird RDBMS provides a broad set of programming interfaces that enable developers to build database applications with greater performance and reliability. But alongside with this breadth of programming and development options comes the need to consider which set of tools for Interbase/Firebird is appropriate for each DBA or user task. Although many tasks can be accomplished in multiple ways, each has highs and lows - so finding the best set of tools for the job is very important for effective database managing. 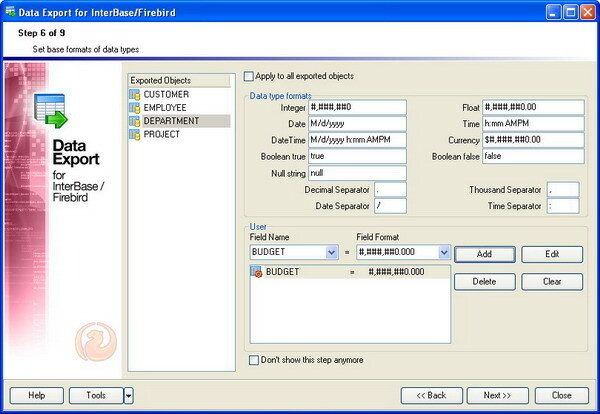 Consider such typical task as exporting data stored in InterBase/Firebird database tables into different file formats. Suppose we have a CUSTOMER table that contains some information about our customers, an EMPLOYEE table with employees’ data, a PROJECT table containing current projects and a DEPARTMENT table reflecting the current organization structure. For our simple example let’s assume that all these tables belong to the same database. Now, we need to export information from the tables to four different files with various formats, for example, Excel, HTML, XML and PDF. Moreover, for some of these tables, we will export only part of the existing fields, and for some fields we will change data formats during the export process. To achieve these goals we will use EMS Data Export for InterBase/Firebird, a powerful program to export your data quickly from Interbase/Firebird databases to any of 19 available formats, including MS Access, MS Excel, MS Word (RTF), HTML, XML, PDF, TXT, CSV, DBF, ODF and others. 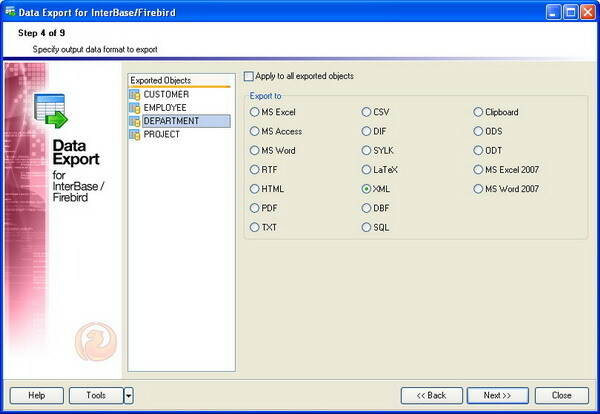 The tool has a user-friendly wizard interface that allows you visually set export options for each table separately, such as destination file type and its name, exported table fields and their order, data formats, and others. EMS Data Export for InterBase/Firebird supports the latest InterBase/Firebird versions, can connect to a database server via local port forwarding through the SSH tunnel and has a command-line utility to automate your export jobs using the configuration file. Let's take a closer look at the work of this program. First of all, we need to specify the parameters to connect to our InterBase/Firebird database. These parameters depend on the server type (InterBase or Firebird), its location and connection method. Also we should specify login credentials and the database file. The remaining options will leave intact as they satisfy us completely. Now we need to choose the tables for the export and select a destination directory. 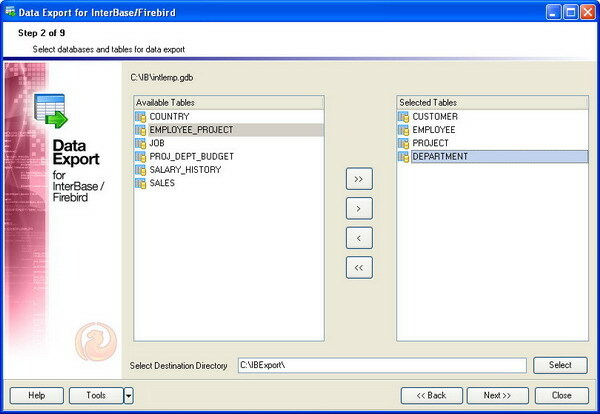 We select the required tables from the list, set a folder for output files and proceed to the next step. The third step of the wizard allows us to add queries whose results will be exported. In fact, this is a very useful feature, for example, to export the results of a complex query applied to linked InterBase or Firebird tables. For our simple scenario we will skip that and continue with the next step. At this step we should select the destination format for the exported data. 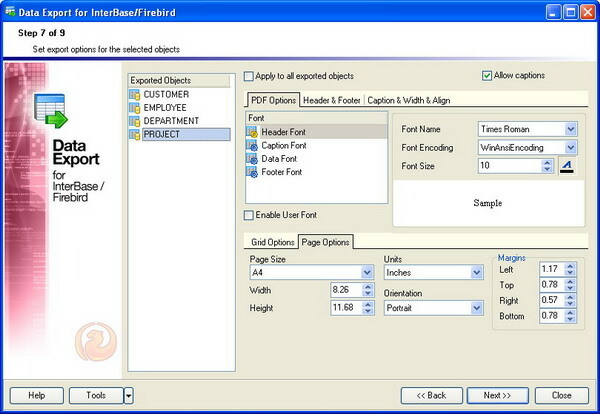 Each exported object can have its individual data format. So we should define the corresponding output format for each of our tables in accordance with the initial task conditions. Proceed to the next screen. 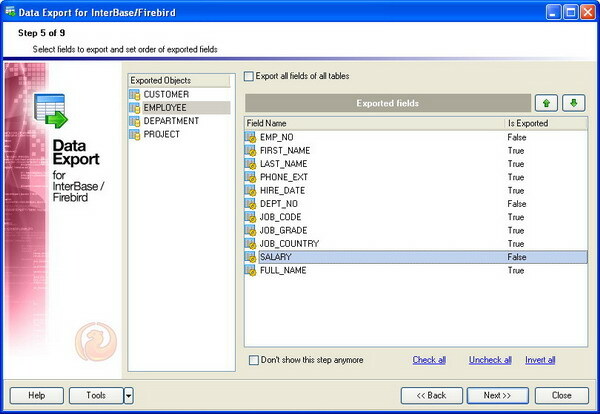 This step allows us to choose InterBase/Firebird database table fields to export and reorder them, if necessary. Let’s exclude the EMP_NO, DEPT_NO and SALARY fields of the EMPLOYEE table from the export and continue. This step is intended for choosing data formats of the exported fields. We will change the format for the BUDGET field of the DEPARTMENT table to define the width and precious of the output data. Additionally, EMS Data Export for InterBase/Firebird allows us to select date, time, decimal and thousand separator, Null string, string representation of the Boolean values and more. Let us continue. At this step we should set specific options according to the selected output file type. As before, each InterBase/Firebird exported object can have its individual settings depending on its output file format. For example, for Excel files we can choose the font, border and fill style for cells and much more; for HTML files we can define the CSS type; for PDF files – page margins, font and grid parameters, and so on. After changing the required options we will proceed to the next step of the wizard. This step of the wizard is intended to set common export options. For each object we can define the name of the destination file, export constraints and other settings. Now we will turn to the last step. This last step of the wizard is used to inform that all export options have been set, and we can start the export process. 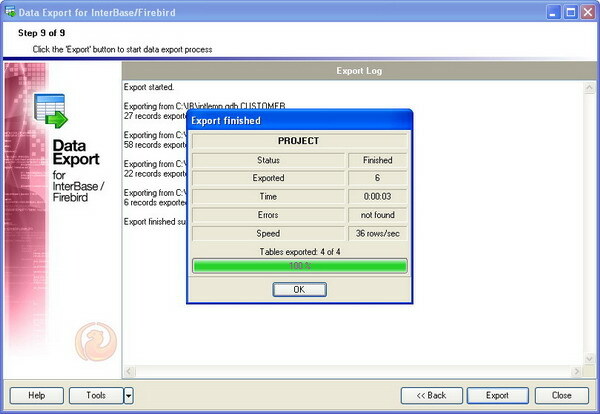 The export process has been completed successfully as it is reflected in the execution log. We have just exported data about customers, employees, projects and departments from InterBase database tables to the four corresponding files according to the given task within only nine simple steps. Well done. Typically, InterBase/Firebird database development project will suffer not only export problems. EMS SQL Management Studio for InterBase/Firebird is a single workbench that responds to today's top IT challenges, helping you to reduce the total cost of ownership by maximizing the IT personnel efficiency.